Courage– Mulan is a Chinese princess, who disguises herself as a man and takes her elderly father’s place in a time of war. Time and training make her a princess warrior and she is instrumental in helping her people win the war. Being a single mom can feel like you are in a war zone. The weight of the world is on your shoulders and one dropped ball can mean disaster. Single moms are courageous. Somehow, we manage to get things done and often alone. The saying is that it takes a village to raise a child. I know that many of you don’t have that village to give you encouragement and support. You keep going. Day after day, you keep going forward, often with no thanks or appreciation. This takes courage, single mom. YOU are a princess warrior! A Servant’s Heart– Cinderella has a true servant’s heart. When her evil stepmother and stepsisters make her do all the chores and treat her like a slave, she doesn’t complain. She does what is asked of her. Her heart aches, but still she doesn’t act out in anger. Cinderella continues to serve with a meekness of spirit and a servant’s heart. I have often felt like Cinderella in my single mom journey. As the single mom of five kids, 8 and under, I often felt like a slave. Trying to keep the house clean, just to have it look like a hurricane hit 10 minutes after the kids got home. I was judged because my house looked lived in and not like the cover of Good Housekeeping. Being a single mom means having a servant’s heart. It means serving our kids in love and knowing that we are shaping their character. It means not grumbling and griping about every little thing. It means cleaning up the spilled milk without making your child feel like a failure because it spilled. It means going to bed completely worn out from taking care of your kids. This too shall pass, single mom. The kids grow up and take on more responsibility. Be patient with your kids. Jesus, Himself, came to serve and not to be served (Matthew 20:28). Wisdom– Pocahontas and John Smith want to bring their two worlds together in peace. It doesn’t seem like it will ever happen. Pocahontas uses wisdom when she convinces her father to let John Smith go and to end the fighting between the two groups. She seeks guidance from Grandmother Willow and uses her wisdom to change her world for the better. Raising 5 kids, I have had many times when I needed to use wisdom to guide my kids in the right direction. Pocahontas sought guidance from Grandmother Willow, as I seek guidance from my heavenly Father. I have needed to use wisdom to keep the peace between my five strong-willed kids. I have needed wisdom in knowing how to guide them in becoming adults and dealing with adult issues. Single moms need to be wise. Wisdom comes from God. We need to seek guidance in every situation. We need to seek guidance before we make rash decisions in the heat of the moment. We have little ones depending on us to do what is right. That takes wisdom, single mom. If we want to change the world, it starts with our kids. We need to raise them, using the wisdom God gives us. Compassion– Belle is compassionate in her dealings with the beast. He terrifies her, but she compassionately nurses him back to health and treats him kindly, despite his appearance and his attitude. Being a single mom means being compassionate even when our kids are messy and cranky. We can’t always see what is going on beneath the surface of our kids attitudes, so we need to have compassion in order to find out what is really going on. Belle uncovered the gentle side of the beast because of her kindness and compassion. We can uncover the gentle side of our kids if we approach them with love and compassion. Hardworking– Tiana is a hardworking waitress who dreams of owning her own restaurant. Sound familiar, single mom? We work our fingers to the bone at outside jobs, go to school and take care of the household too. Hard work is what gets things done and bills paid. It seems like the work will never end, but it will. Never give up on your dreams. If you keep working, focused on what you want, your dreams will come true. Trust in God, the dream-giver. You are a princess, single mom! 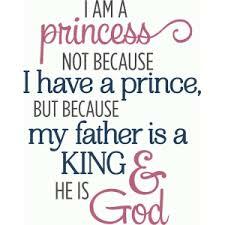 You are a daughter of the King of Kings and Lord of Lords! Remember that a true princess is not a spoiled brat, who expects to be waited on, but a woman of strong character and who carries herself with integrity. Your children are watching. Be a role model that they can emulate. When tough times hit, remember your princess status and act with grace and dignity. Easier said than done, I know. I mess up more than I like to admit, but I do my best and that’s what counts. Call on our heavenly Father in the struggle and He will give you the strength to make it through. He sees your struggle and wants nothing more than to help you, His daughter.